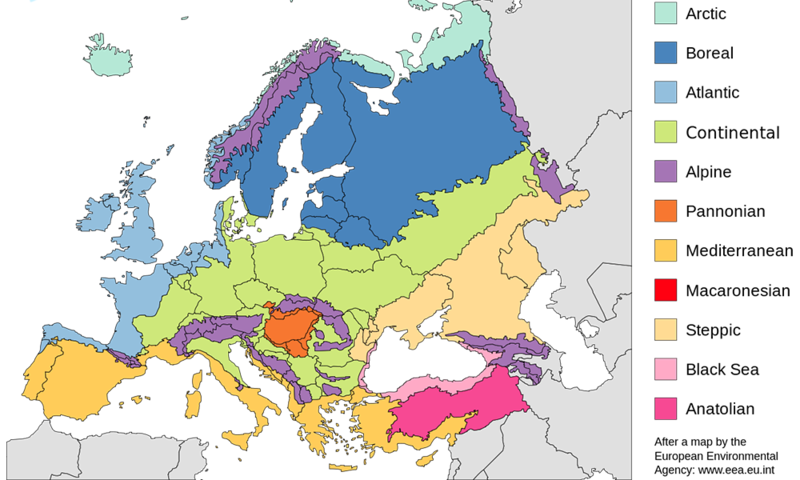 Europe is in the temperate zone of the northern hemisphere apart from a small piece in the northern Arctic Circle. The location is ideal and as to the climate. It is considered the most favored region of the planet because it is located away from climatic excesses - the high temperatures and the unstoppable rainfalls - although the dramatic changes of the recent years in climate, had their impact, leaving Europe nothing but unaffected. But this does not change the reality of centuries and centuries. There is also another significant reason for the privileged position, the meteorological conditions. The amazing shape of the coastline with the countless indentations, allowing the sea to a beneficial effect on climate. The Mediterranean Sea south and the Atlantic Ocean north and west. The climate, the geographical position and the terrain in combination with the deep penetration of the sea, played a key role on the habitation of Europe, from the very ancient times, from the first appearance of man on earth. This combination has provided appropriate conditions and easy approach to successive continuous migration flows of many different tribes throughout the centuries. This also explains not only the history but also the density and the variety of the population. Finally, explains the evolution and the development of Europe.